Levels 3 & up get a post card of the pin-up art every month! Levels 4 & 5 get a Permatweet, Level 5 gets an Erf ID! 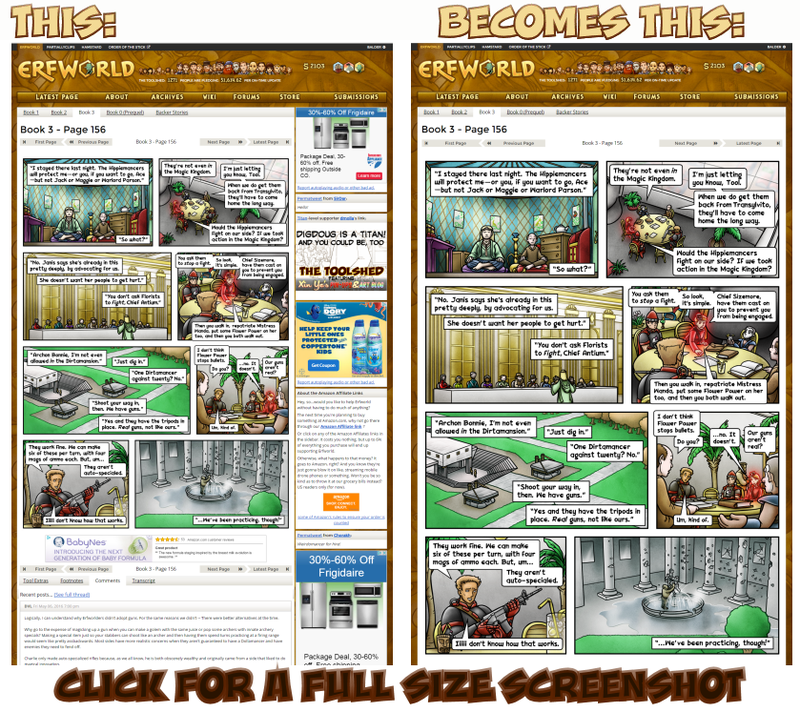 Level 6 gets a Graphical Ad on the Erfworld sidebar! The Toolshed is our new subscriber program. It's a way for you to help Erfworld stay afloat and get some fun site perks and bonuses, including a new pin-ups & art blog by Xin Ye! Oh? What about the Toolbox? Erfworld started in 2006 on Giant in the Playground's website, then in May 2009 we launched on our own site. That launch included a subscriber program we called "the Toolbox." Our supporters pledged $3 a month for an equivalent amount in store credit plus access to the Toolbox (a collection of bonus content such as lost art, scripts, and desktop wallpaper). That $3 a month has been a backbone of our business model ever since. But in 2013, Patreon launched as an outstanding platform for all kinds of creators to do that same kind of thing. They also showed the value of having different pledge levels and rewards. In December of that year, Patreon contacted me about setting up a project page. But we weren't ready yet. We were still building the new website, and it was going to be too difficult to integrate Patreon with the Toolbox. So we made plans to do that after the new site's launch. In November of 2014, we were ready to start a Patreon page. But the more we looked at it, the more it seemed that integrating with Patreon would be almost as technically challenging as just building out the Toolbox to work more like a Patreon page. So that's what we did. With the "Toolshed" (it's much bigger than the Toolbox), we have exactly the custom tiers we wanted, fully integrated with our website, and nobody takes a cut of your donation except for PayPal or Stripe. What do I do if I am a Tool already? Well, first of all, thank you! On launch day, we awarded all active Tools in the Toolbox an Old School Tool site badge. If you want to keep the same deal you've always had at $3/month or $33/year for Toolbox access, then you don't have to do anything at all. This is equivalent to a Level 1 pledge, but with 30 Shmuckers a month instead of 5 per on-time update. No new Tools will be signed up under that plan, and if your subscription is cancelled (as PayPal sometimes does automatically when your payment methods change or expire), then you will not be able to renew under the old plan. If you would like to pledge at any of the new levels in the Toolshed, go ahead and sign up now. We will take care of cancelling your old plan through PayPal. You will keep all the Shmuckers you currently have, and start earning new ones through the Toolshed. If you are a yearly subscriber, your remaining months of Toolbox access will continue if and when you cancel your new subscription. So, I'm pledging per on-time update. What's an "on-time update?" We are also doing the Kickstarter backer stories on some Sundays. Eventually, we'll begin the final part of Book 0: Inner Peace Through Superior Firepower, and those will go up on Sundays as well. We make no promises about updating or not updating on any given Sunday, but you can add the Sunday updates to your pledge if you'd like to express your support for those, too. No, your pledges will be added up and you'll be billed on or about the 14th of each month. PayPal isn't very good about micro-transactions, so that will keep our fees down and your email box quiet. And if you change your pledge level in the middle of the month, updates that happen after the change will reflect your new level. We never actually see your billing information, even for the Erfworld store. Only Stripe and PayPal collect your credit card info, and they have huge security departments. What little information we keep on Erfworld accounts is never sold or used for anything else. Kickstarter has been great for Erfworld. We've run several projects since 2012, all of them to raise the funds we needed for specific goals such as printing books and making calendars and pins. We have also raised the money to pay the artists to draw Book 3. I believe that highly skilled illustrators like Xin and Lillian should be paid on delivery, get professional rates for their work, and should not have to worry that the money won't be there. Knowing exactly how much we were able to raise on Kickstarter let me decide how much art we can have for the site and the books. But project crowdfunding (like Kickstarter) and subscription crowdfunding (like Patreon) are different animals. Not one dollar of what was raised through Kickstarter was ever slated to put a roof over my head or gas in my tank, for instance. "Pay Rob's health insurance" was never a stretch goal. But I do need health insurance. So I'll have to be able to make my living in other ways. Store sales, convention sales and site ads are turning out not to be quite enough, which is where the Toolshed comes in. By pledging dollars for Shmuckers, you'll essentially be pledging to pre-buy enough merch to pay me what I need to live on, pay Linda to handle the orders, shipping, and customer service work, and keep Erfworld going as a business. Erfworld was 8 1/2 years old in March of 2015, when we launched the Toolshed. Up until that point, we had never been able to maintain a consistent schedule. We had a lot of disruption and drag, which makes everybody unhappy. Since the Toolshed started, things have gotten much better. Life still happens. The artists are people, and I'm people too. We have families, we get sick, we need time to do things that are not Erfworld. My feeling on it is that when something is happening in the artist's life, then they should take the time they need to deal with it. And yes, they do get to keep the details private. I will not make news updates with promises I can't keep, and I will not share the details of my collaborators' private lives with the internet. By tying your support to our delivery of on-time updates, it will hopefully take some of the sting out of it when we inevitably miss some. And I hope everyone will understand that we are always trying our best, even if we don't share all the ugly details of our personal struggles. Thanks for understanding. I've also seen some comments along the lines of, "How hard can it be to build a website? Lots of comics do that without raising money for it." Well, that's kind of an apples to Apple comparison. If you remember, for five years we had a WordPress site built on a volunteer basis for us by Harknell. It wasn't bad, but it wasn't anything like what I wanted an Erfworld website to do. The new site is much more sophisticated code-wise, and mostly custom coded. And a lot of what we hope to do with it is still on the development slate. We started the website project in 2012. It didn't go well at all. I'd say my experience with trying to get it built has been somewhere between the Book of Job and this scene from the Simpsons. But we've come through that. We've got a smooth-running code base that does a lot of difficult things really well. 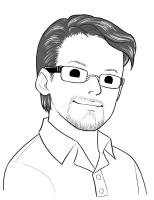 We finally have a stable, reliable web team in Brendan, John and Red, with occasional design help from Josh and Steve. New features are going in all the time, and technical problems (including tricky billing issues with the Toolshed and store) are getting dealt with and fixed as they happen. It's night and day on the tech side, versus a few years ago. Hard work and expertise also deserves fair compensation. So the web team gets a share of what we loosely call "profits" from the Toolshed, store, and ads. Keeping them happy (and sticking around) is important to keeping Erfworld going and growing. It's a weird time to be a writer or an artist or a musician or a voice personality or an animator or a filmmaker, at least if you're trying to make that your job. Almost every creative field used to follow a model where you'd have to "break in" with some kind of label or publisher or studio, sign a contract, and just get paid to do what you do. Now, a lot of us are using technology to reach our audience directly, which is incredibly empowering for the artist but also confusing and scary. We have to figure out a way to run it as a business and make it pay. That's not something that comes naturally to creative types. It's also a weird time to be in the audience. Readers, listeners and viewers have access to much more stuff now. Most of it is free, and some of it is even stranger than Erfworld. More and more, you're seeing the creators of the stuff you enjoy put our hands out to say, "Please donate. Help us make more of this." It's getting noisy. It's maybe not so fun anymore. There are a few too many of us on the sidewalk now, holding up cardboard signs saying "please help." You can't (and shouldn't) empty your wallet by throwing bucks into every open guitar case you pass. But still, it's important to support a few of the things you truly do care about. Because those things may go away if you don't. You're the only one who can make that decision about who to support. You can cast your vote for the best stuff, with a few dollar bills pledged here and there. I really hope that what we're doing here means enough to you that you will choose to pledge something to Erfworld. From Rob, Xin, Lillian, Linda, John, Red, Brendan and the rest of Team Erfworld, thank you very much! For Team Erfworld - Erfworld becomes a real professional job, with savings and retirement plan, vacation time, etc. We can also afford more professional services to help us run the business side (legal/accounting/tax/technical), and Rob & Linda can do things like buy a house (with a real office to work in).